Paris. City of love, city of romance. The last place you want to go to on a work trip when you're in the middle of an epic dry spell. But that's where Poppy is headed, along with her colleague Charlie, who's shallow and annoying but very, very good-looking. During a white-wine-fuelled Skype session with her friend Alice in LA, Poppy concocts the perfect plan: work by day, and have some no-strings fun with Charlie by night. Of course, it might prove a little more complicated than that, but it's nothing Poppy can't handle - or is it? 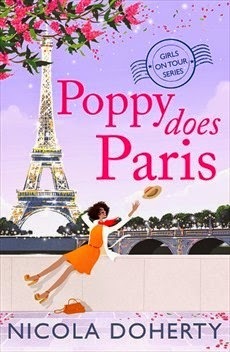 Poppy does Paris is the first instalment in this hilarious, romantic and unputdownable five-part series. The next part, Lily does LA, will be published on 25th September 2014. I heard about the Girls on Tour series on Twitter. I looked it up on Amazon, loved the sound of the book, fell in love with the beautiful cover and hit the pre-order button right away. This was the first time I picked up a book by Nicola Doherty. It won't be the last! Meet Poppy, a twenty-nine years old bussiness woman who is working in the publishing industry. I can tell you I loved Poppy from the very first second! She is so entertaining, fun, easy to like and releat to. The story followed a brilliant storyline which made me giggle the whole way through. Poppy is off to Paris with her colleague Charlie to meet a client, Jonathan Wilder, to talk about his new book release. Unfortunately Poppy has been unlucky with men lately. To end her dry patch she has some dirty plans on her mind with Charlie for this weekend. As you can imagine, her plans turn out much differently and she finds herself in another mans bed. How can she get out of this mess? Paris is famous for to be the city of love. I've been to Paris once and visited most of the places Nicola wrote about. I loved that I even felt more connected to the story for this reason. I wished I could have beamed myself to Paris to see all these wonderful sights again. Preferably siting in a romantic café near the seine with a tasty glass of french wine in my hand and with a view to the eiffel tower. The only thing I was a bit struggeling with were the french dialouges. I can't speak french so I needed to look up a few things. This book was an absolute pleasure to read. It made me laugh more than I have in a long time in a book. It had everything that I love in a great book - humour, wit, life-like characters, light-hearted romances, a fast pace, twists and a beautiful setting. I'm so looking forward to read the rest of the series. Hurry up September! Thanks so much Isabell, I'm so glad you liked it. Your site is so pretty!